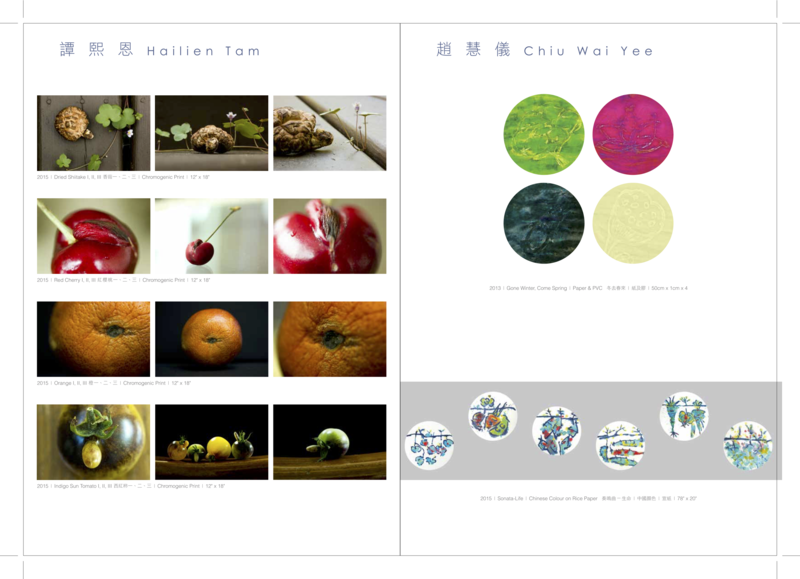 UPCOMING GROUP EXHIBITION FEATURES NEW WORK BY SYNN KUNE LOH. 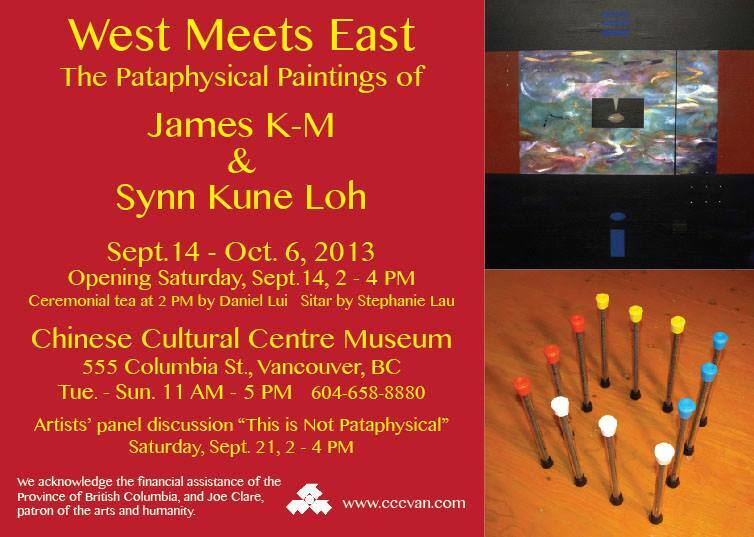 Opening Saturday, Sept. 14, 2 – 4 pm, the Chinese Cultural Centre Museum is pleased to present West Meets East: The Pataphysical Paintings of James K-M and Synn Kune Loh, in the On-Tak Cheung Gallery at the Chinese Cultural Centre Museum at 555 Columbia Street, from Sept. 14 – Oct. 6, 2013. 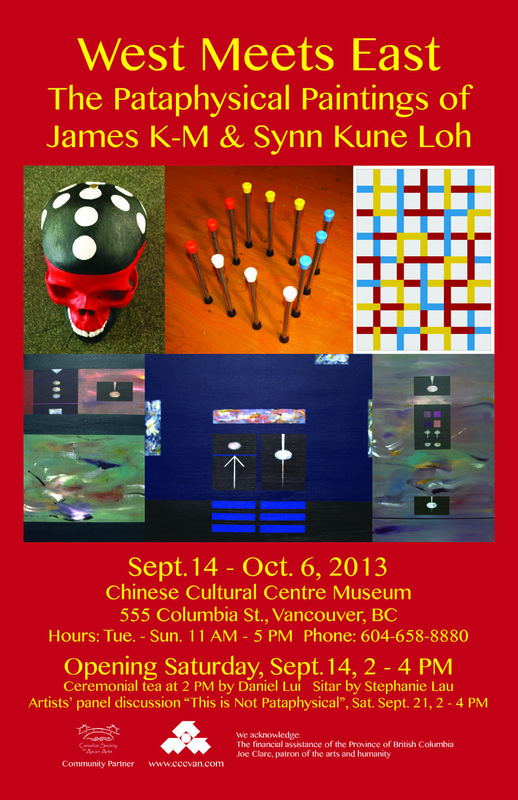 “This exhibition is an experimental departure for the CCC which usually only shows work by Chinese-Canadian artists,” said Gallery Director, Toni McAfee who worked with the artists to produce this significant exhibition to expand expectations and create new connections. For the first time Vancouver abstract artist James K-M will exhibit his “Doorkeeper” series of paintings created in 2012 during an invited summer residency at the Josef and Anni Albers Foundation in Bethany, Connecticut. Also inspired by Franz Kafka, Joaquín Torres-García and Alfred Jarry, the unified series of 10 paintings, on grids of 2″ x 2″ wood, reveal the 3 dimensional relationships of form and colour in complex gates or doorways. He will also be showing painted sculptural works that employ hockey pucks, rebar, hard hats, a plastic human skeleton and real animal skulls. K-M’s works are intended as a contemporary expression of the primitive, primal, primordial and … the pataphysical. 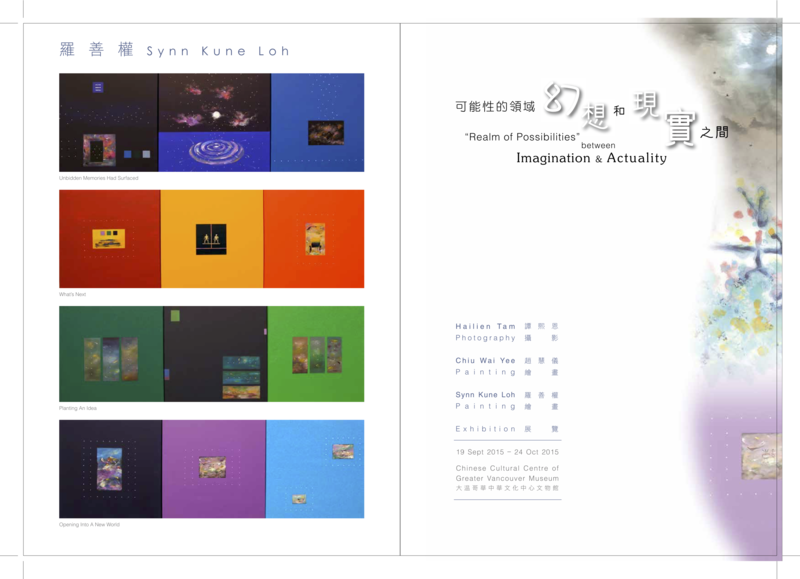 As Synn Kune Loh further expands his exploration of molecular language and consciousness, he uses abstraction to communicate life reflections in over 20 new paintings. Synn Kune’s new series has two sources of inspiration. The first is found in the mystical content of the Chinese written character. The artist decodes the surface meanings of the written word and weaves them into abstract and molecular forms. The second came from the novel, 1Q84, by famous Japanese writer Haruki Murakami, which tells the story of moving between parallel existence, redemption and rebirth. Synn Kune’s new paintings combine these aspects and invite viewers to step into the boundless explorations of the pataphysical. 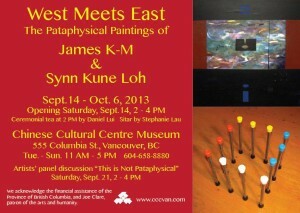 What are “the pataphysical paintings”? Find out Saturday Sept. 21, 2 – 4 pm, when the gallery at the CCC Museum will host a lively artists’ panel discussion: “This is Not Pataphysical.” As the artists speak more about their work, they will discuss the process by which metaphysics expands into the abstract and artistic realms of the pataphysical. Please also join us at the opening reception at 2 pm, September 14 for Chinese ceremonial tea by Daniel Lui, with sitar by Stephanie Lau. Artists will be present. 555 Columbia Street, Vancouver, B.C.